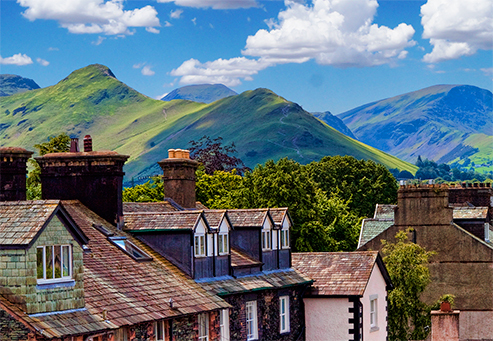 Keswick View 4-star self-catering holiday apartments are situated in Keswick town centre with private off-road parking. An excellent choice of restaurants, shops and pubs are available on the doorstep and the cinema, theatre and Derwentwater lake are a short stroll away. Our apartments are equipped to a high standard and each sleeps up to 4 or 5 guests. Larger groups can book two or three apartments. Each apartment has two bedrooms: a double with king-size bed and a twin with two single beds. The upper two apartments also have en-suite bathrooms. Other facilities include comfortable lounges, well-equipped kitchens, free wi-fi and use of our private car-park. Visit our Accommodation page to compare different features and facilities or follow the links below to explore individual apartments. The Garden Apartment has level access from our private car-park. It is popular with a wide range of guests, including those with limited mobility, young families and mountain bikers. The spacious lounge overlooks a patio garden. Whinlatter is a spacious first-floor apartment. It is popular with families, couples and friends. The modern, open-plan lounge, kitchen and dining area enjoy fine fell views towards Catbells and Newlands valley. Its two bathrooms provide extra flexibility. Castlerigg is a comfortable, cottage-style apartment. It enjoys great fell views towards Catbells and Newlands Valley and also towards Latrigg and Skiddaw. It is particularly popular with walkers and its two bathrooms provide flexibility. Castlerigg can sleep an extra person in a comfortable z-bed.